HOLIDAYMAKERS visiting two parks on Morecambe Bay can expect to see a new face welcoming them this summer - mascot Buzz the Bumbaloo. Buzz is the latest new recruit to the entertainment teams on Ocean Edge and Regent Holiday Parks this year and is proving to be a big hit with the little ones. 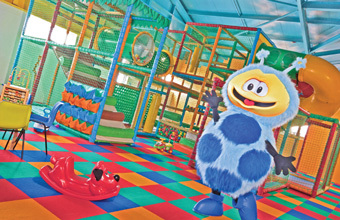 Young visitors can also join in at a new kids club - The Buzz Club. Every child under the age of 12 arriving on the parks will receive a goody bag complete with Buzz rucksack, face mask, activity book, crayons and a Frisbee as well as their own new park pass.